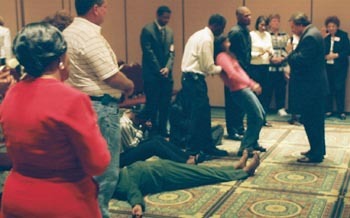 Uplifting, often energetic, rhythmic music with lots of percussion instruments, led by dynamic, “charismatic” personalities who prance, shout, run, strut, slide and even dance across stages and platforms are elements of a “worship in the flesh.” Charismatic, Pentecostal worship provokes an emotional, sometimes demonstrative response, an outburst of some kind. Extremely skilled at manipulating a crowd by stirring up the emotions, once sufficiently stirred, the characteristic outbursts are shouts, screams and similar outcries that will ignite an entire congregation. Demons use these kinds of outbursts to counterfeit the Holy Ghost with nonsensical laughter, shouting, falling slain, rolling on the floor,running up and down aisles, and even throwing money at the feet of a prominent evangelist, and other forms of emotional frenzy. I must concur with the late Dr. Lechler, a German who practiced psychiatry before I was born. Five or more decades later, what I have found astounding is that in practically every case of demonic torment among my own Christian clients, a common factor is that 95 percent of them were not demon oppressed BEFORE they went to a charismatic, “word of faith, non-denominational church.